Little peeps love to play with pretend food, but we don’t all have the room or the budget for an entire play kitchen set. One way around this is to downsize to a smaller pretend food play idea: the tea party! Tea parties are extra fun because children get to munch on pretend sweets, treats, and other party fare at their leisure. Tea parties are also mobile. During the summertime, a child can throw a garden tea party, while a tea party in front of a cozy fire wards off winter chills. Your little one can even carry her tea party set off to her best friend’s house, to be a traveling hostess with the most-est! If your child has tea party dreams in his or her head this holiday season, here are four very different eco-tea party sets to choose from. First above, the Vilac Tiny Bug Dinner/Tea Set is one of the most colorful child-sized play dish sets around. Vilac products are manufactured using non toxic, child-friendly substances. This set comes with oodles of fun tea party supplies: 1 tray, 4 cups, 4 saucers, 4 plates and 1 tea pot. 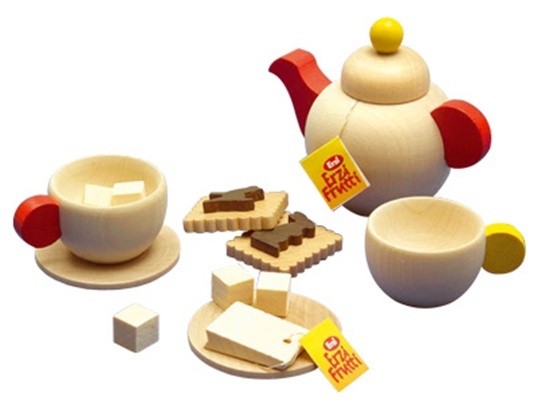 The Plan Toys Tea Set has a natural look, and is made entirely with chemical free recycled rubberwood and finished with non-toxic water based dye. The set is complete with a teapot, sugar bowl, milk pitcher, 2 tea cups, 2 saucers, 2 tea spoons, 2 tea bags, and 2 adorable pieces of wooden sugar. 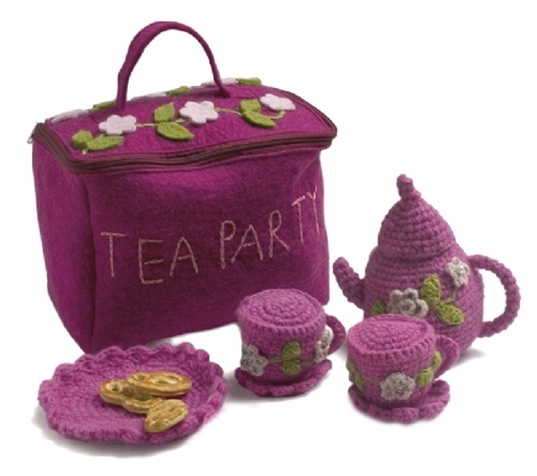 The lovely and unique Crochet Tea Party Set is made ethically in Napal by the amazing En Gry og Sif. This 100% Pure Wool set is dyed with ecologically approved colors, and comes with a basket containing a tea pot, 2 cups, 2 saucers, and 1 plate. 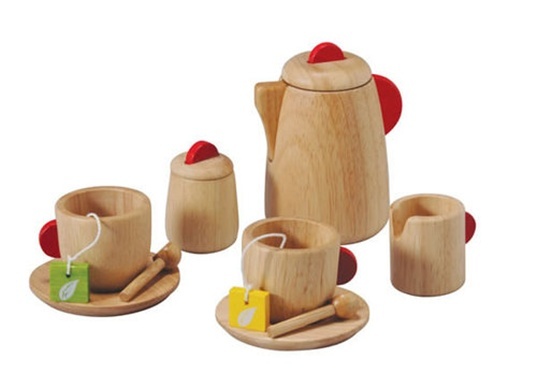 This Wooden Five Piece Tea Set from Erzi is a great holiday gift pick. Erzi is a company producing safe, fun and lovely products in an environmentally ethically way. This tea set is crafted with all natural materials and decorated with non-toxic lacquers. It comes with 2 Teacups, 2 Saucers, and a Tea Kettle. Stay tuned for tomorrow’s post about eco-tea party treats that will add to the tea party fun! Little peeps love to play with pretend food, but we don't all have the room or the budget for an entire play kitchen set. One way around this is to downsize to a smaller pretend food play idea: the tea party! Tea parties are extra fun because children get to munch on pretend sweets, treats, and other party fare at their leisure. Tea parties are also mobile. During the summertime, a child can throw a garden tea party, while a tea party in front of a cozy fire wards off winter chills. Your little one can even carry her tea party set off to her best friend's house, to be a traveling hostess with the most-est!